Woohooo! OK its only beta, but I'll give it a go! Start here, the download is here and you'll need the multimedia downloader as well. After getting th e 2 applications, launch Nokia Multimedia Transfer and you'll get the double headed arrow in the menu bar. You'll have needed to pair your Phone, and on the phone set as Authorised (Tools>Bluetooth>Paired Devices select laptop and press Options). 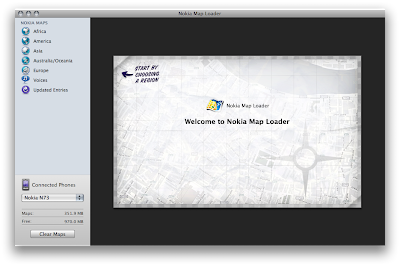 A few seconds later the Nokia Map Loader comes up, looking similar to what you get on the PC. Follow the instructions, and download a map. 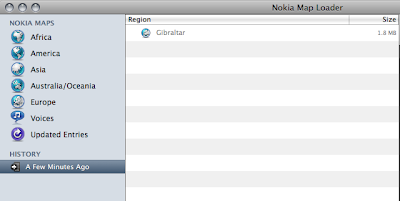 I chose Gibraltar as its quite small. One nice thing is the history function, so you can see what you already downloaded. OK it doesn't actually poll the phone for what was there previously, but its a start. If you cannot use Bluetooth for some reason, you still use USB. Connect your phone by USB, and put the phone into "PC Suite" mode. 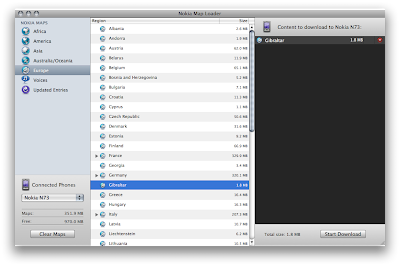 Then launch Nokia Map Loader.